“Is this all there is?” Colleen Carroll Campbell found herself asking that universal question midway through college. Every generation needs to discover the role of faith in their lives and to seek answers to the hard questions such as the meaning of life and the role of suffering. While human nature may remain fairly consistent, new realities and cultural influences require new synthesis. 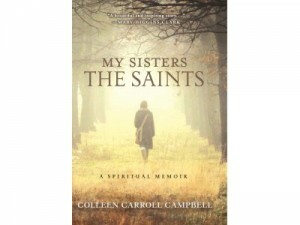 With My Sisters the Saints: A Spiritual Memoir(Image Books, 2012), Campbell looks to the wisdom of the saints to help light the way for young and early-middle-aged women today. Campbell, just shy of forty, has lived a life most of us can only dream of. She worked as a speechwriter for President George W. Bush, met Pope Benedict XVI, is a successful columnist, television personality and book writer, has traveled the world and married a doctor. Yet, she has also experienced great pain as she struggled with being a woman in the modern-era. Many of her difficulties are ones that most women can relate to, such as trying to navigate college life, attempting to balance a personal and professional life, and determining when to get married and have children. Her most painful struggles are less common – facing her father’s twelve-year descent into dementia and her own diagnosis of infertility with the accompanying challenge of seeking treatment in keeping with Church teaching– but all can appreciate her pain. While the details may change, every life has its share of sorrow. Every person asks questions that lack easy answers. Campbell shares fifteen years of her life with profound honesty. She shares her faults and failings, joys and sorrows. She was blessed with parents of great faith who proved to be a tremendous influence in her life. Their example looms large in this book. They introduced her to many of the saints who would become her companions on her spiritual journey and her quest to follow God. At various times, St. Teresa of Avila, St. Therese of Lisieux, St. Faustina, Blessed Mother Teresa, St. Edith Stein, and Mary, the mother of Jesus, each speak most loudly to her. Campbell deftly weaves brief biographies of each of these saints into her narrative while sharing what she found to be their most important lessons in living. My Sisters the Saints: A Spiritual Memoir is for every Catholic woman who has ever struggled with what it means to be a modern Catholic woman. Campbell is a fellow imperfect woman doing her best to walk in God’s path. One cannot help but be touched by Campbell’s honesty and the way God has worked in her life. The lessons that she learned from the saints are lessons that each one of us can also learn from. Her beautiful story has much to offer.